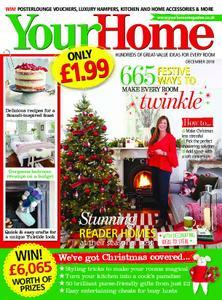 Your Home – December 2018 After weeks of build-up, Christmas is almost here. It may well be ‘the most wonderful time of the year’, but it can be a stressful one, so in this issue we’ve done our best to make it easier for you. We’ve trawled the shops to find the most exciting and unusual gifts for your family and friends and they’re all under £50 (p.40). Plus, we’ve got an amazing subscription offer for you on page 86, where you can buy five issues of Your Home for just £5 – it makes the perfect gift (or even a cheeky treat for yourself!) If you’re looking for inspiring new ways to dress up your home over the festive season, then turn to page 36 for our easy-to-copy styling and crafting ideas to give it that all-important personal touch. We’ve got even more brilliant craft projects for you in our 12-page pull-out section this month – from a stunning copper stag’s head (p.62) to a pretty embellished stocking (p.64) and a host of simple-to-sew felt decorations (p.60), they’re just the job for making your festive scheme look truly unique. If the thought of cooking a family feast for the big day is stressing you out, then turn to page 104 where we’ve picked the best ready-made dishes from all your favourite supermarkets to help take the pressure off. But if you really love to cook, then do try our delicious recipes for Christmas dinner with a Scandi twist (p.100). Finally, I’d love to wish you all a very happy Christmas. See you in 2019!